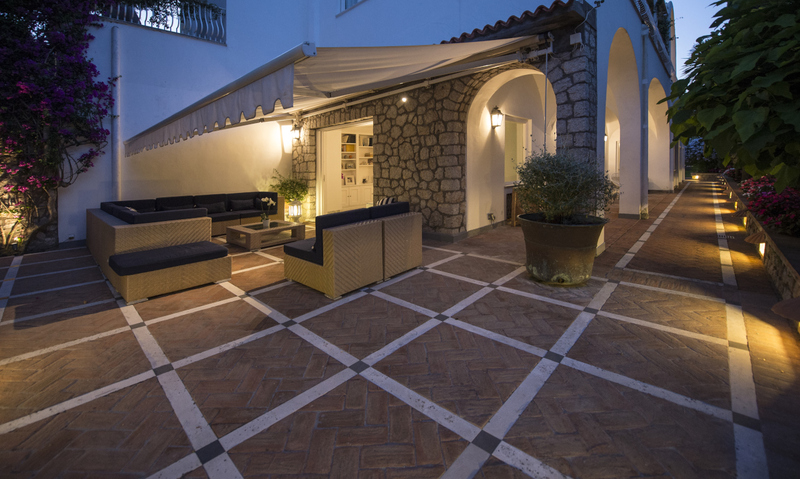 This 3-story villa enjoys 5 bedrooms and 5 ½ baths, with 2 double bedrooms on the first floor and 3 on the second. 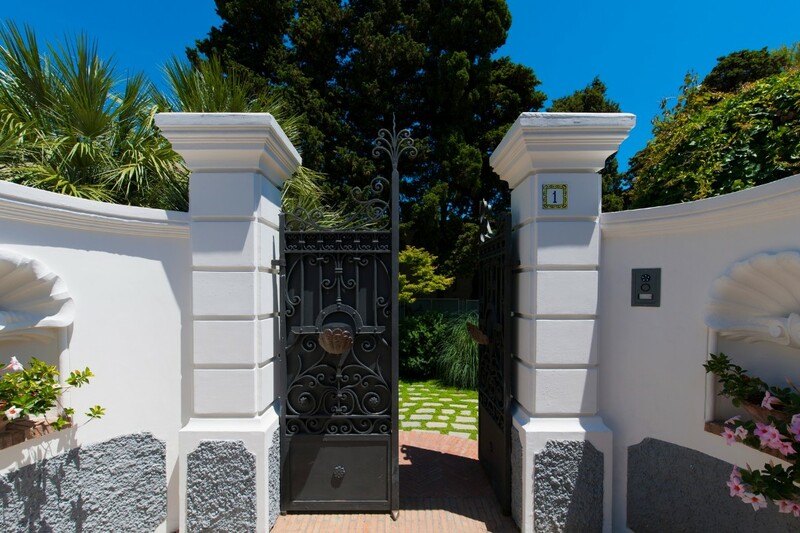 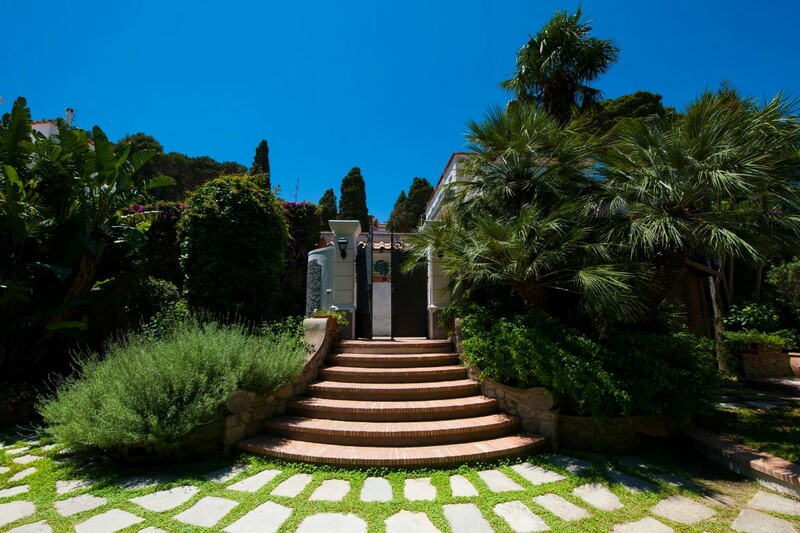 Entrance to the villa, through a private gate, leads you into the garden foyer where the pool (5.5 meters x 5.5 meters) set on a marble paved terrace and pool house is located. 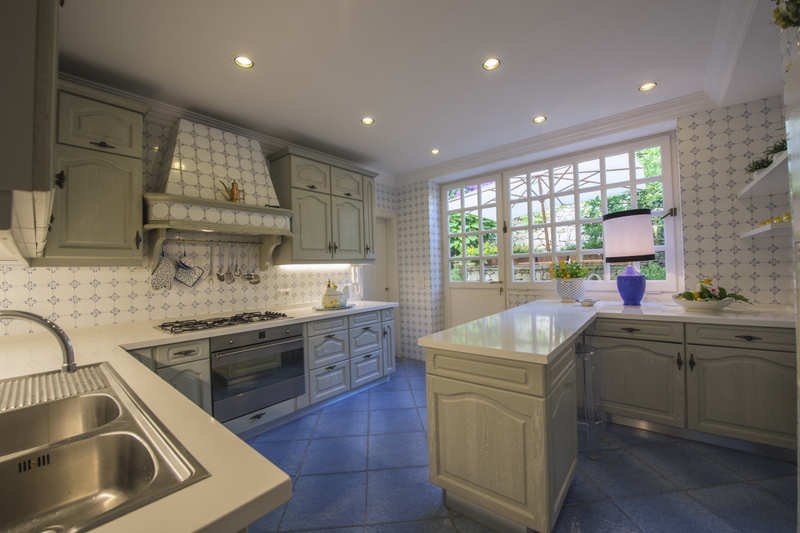 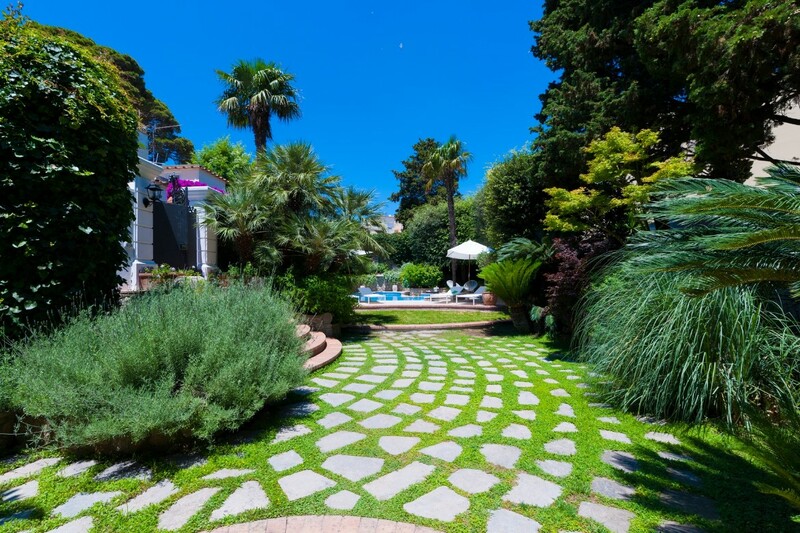 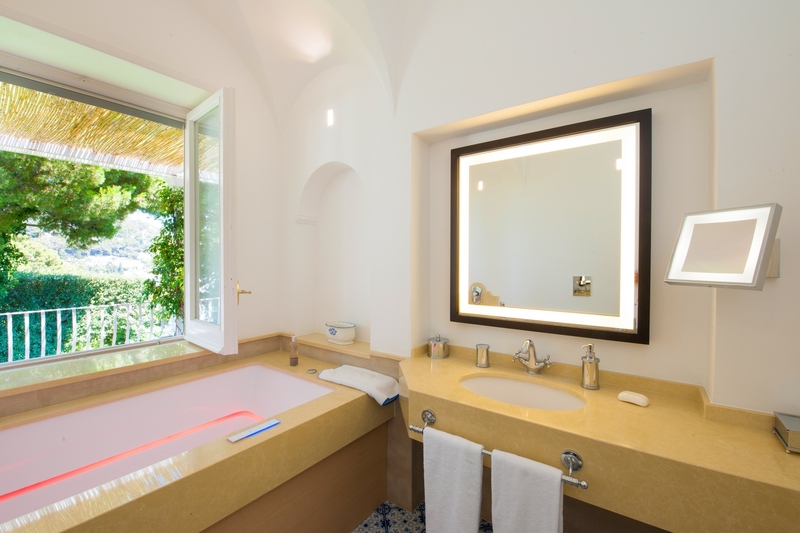 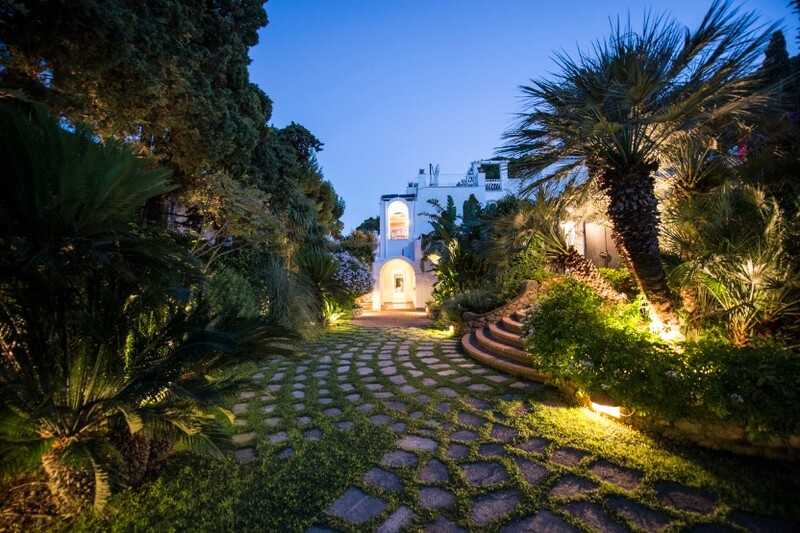 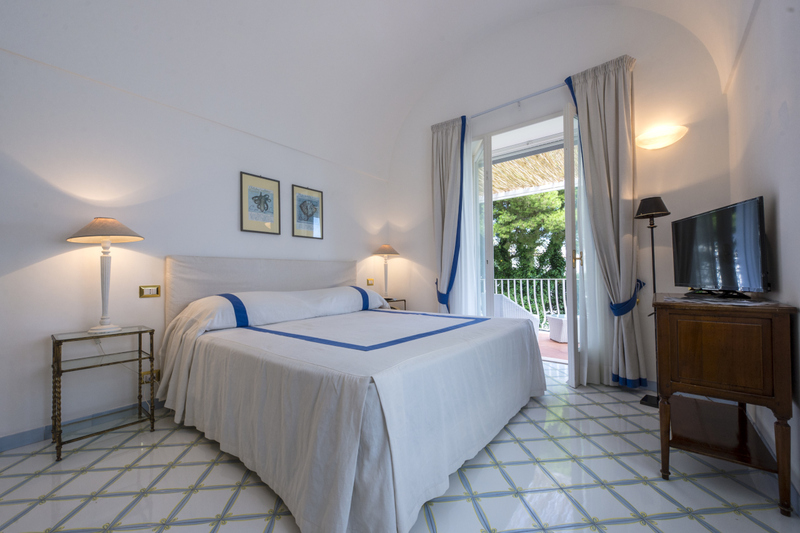 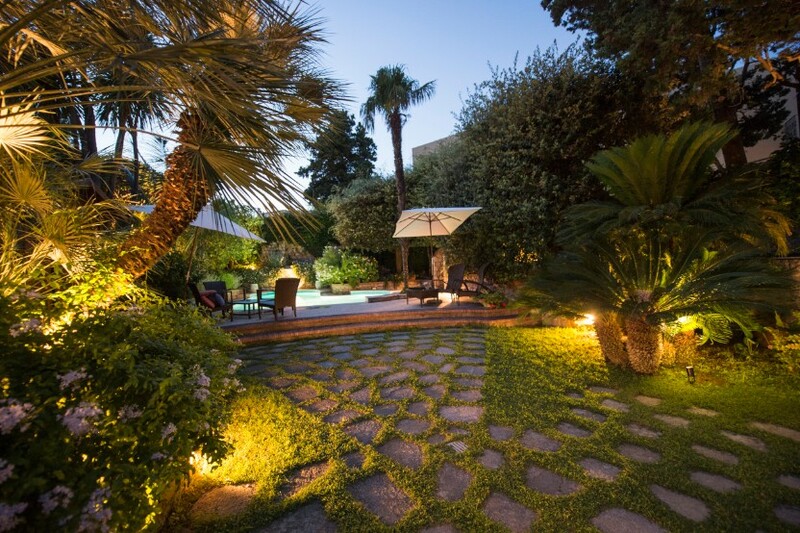 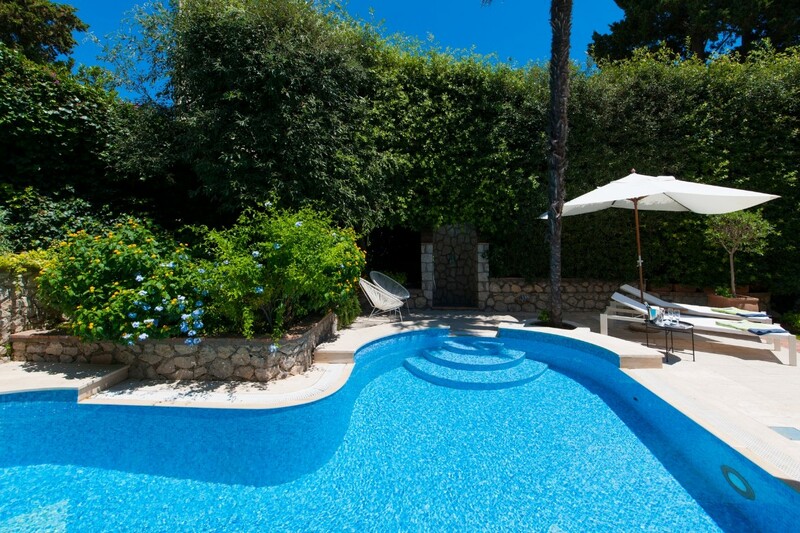 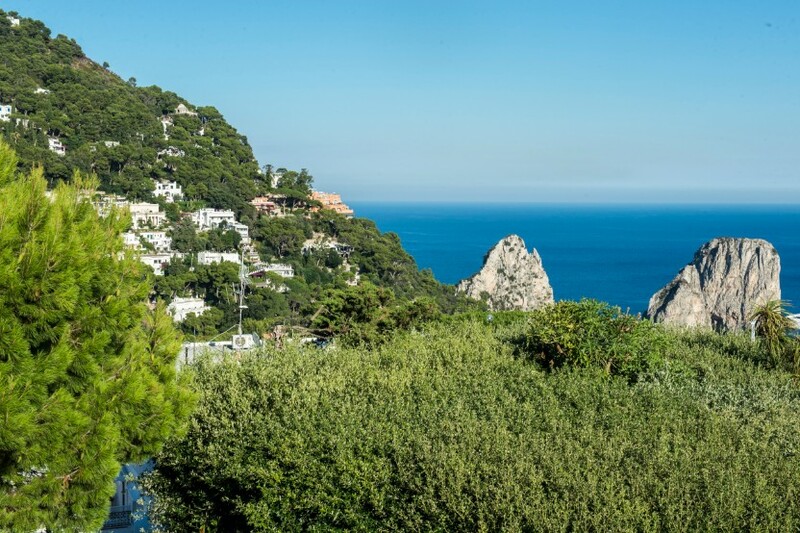 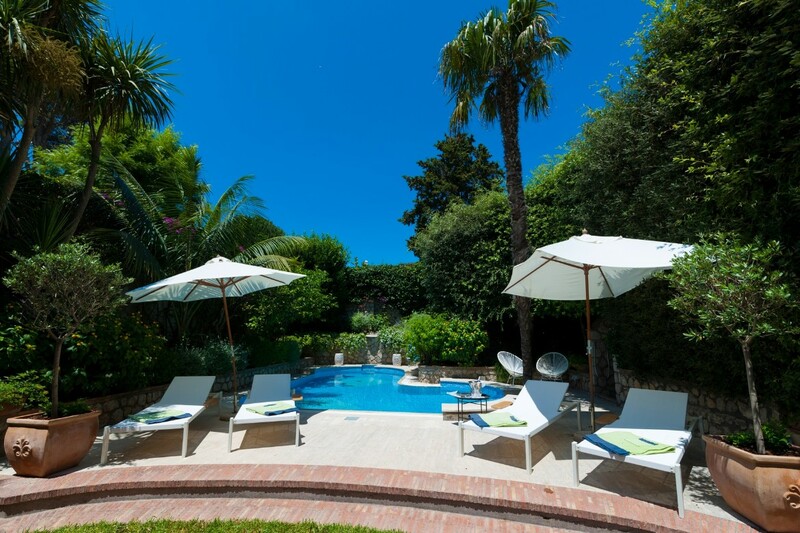 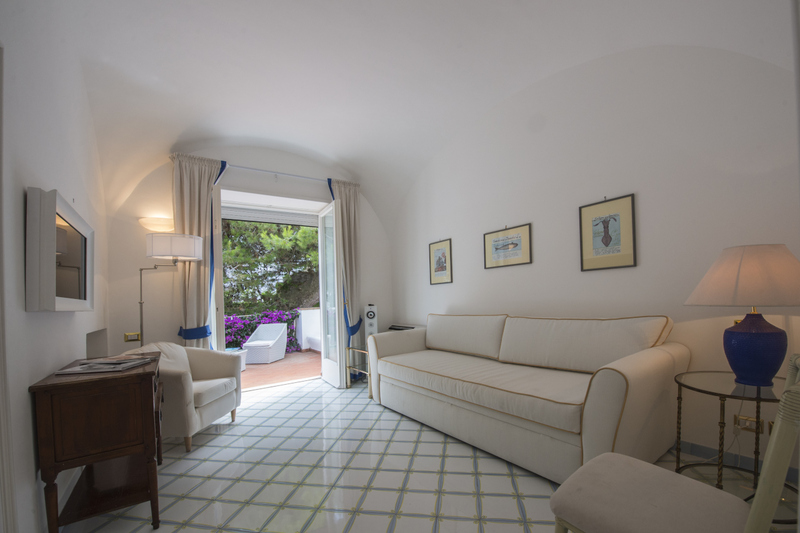 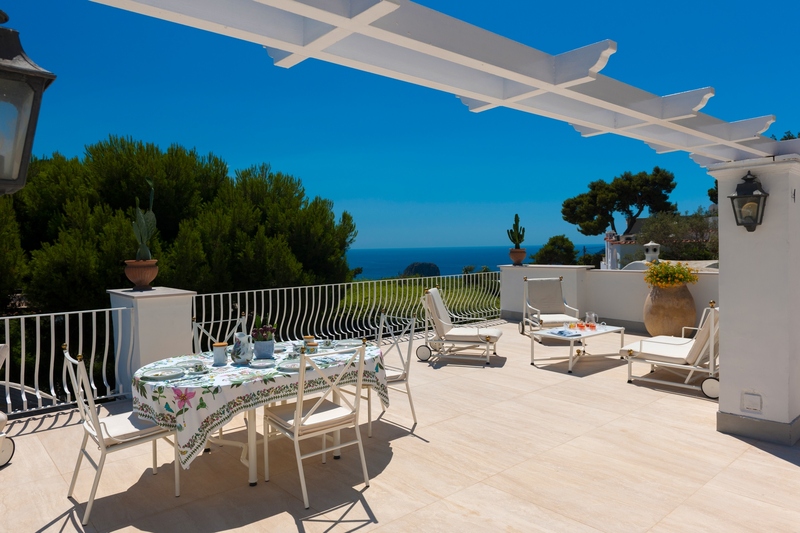 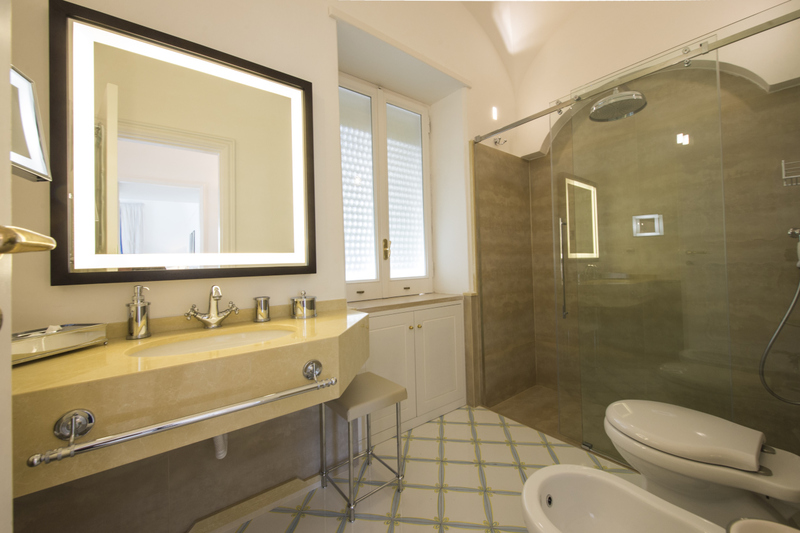 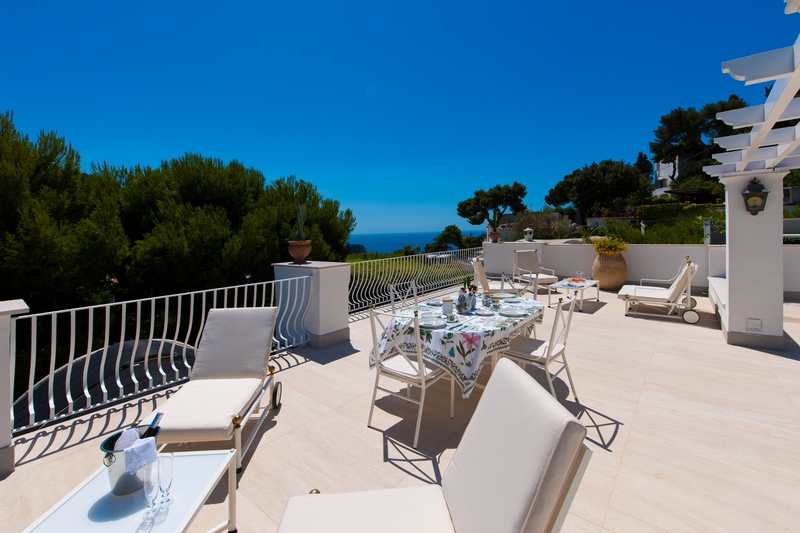 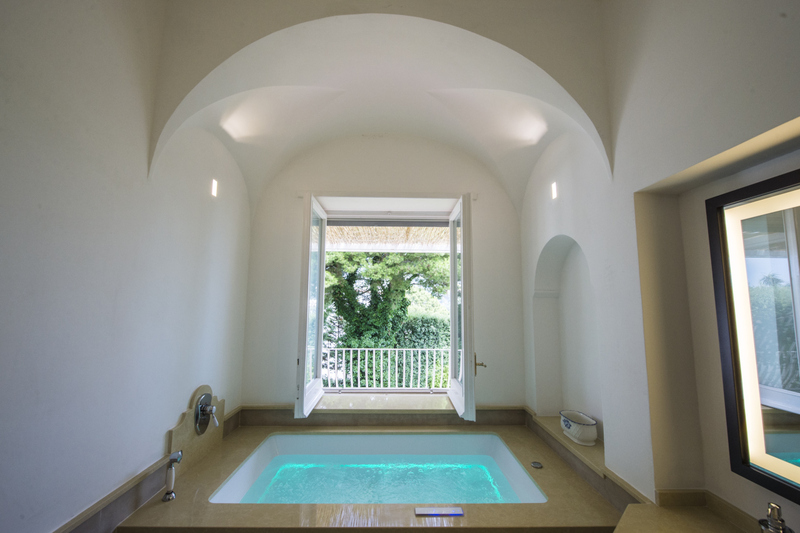 This beautiful property on the marvelous island of Capri enjoys the best possible location – smack in the center, a five-minute walk from the infamous Piazzetta – the main square of Capri. 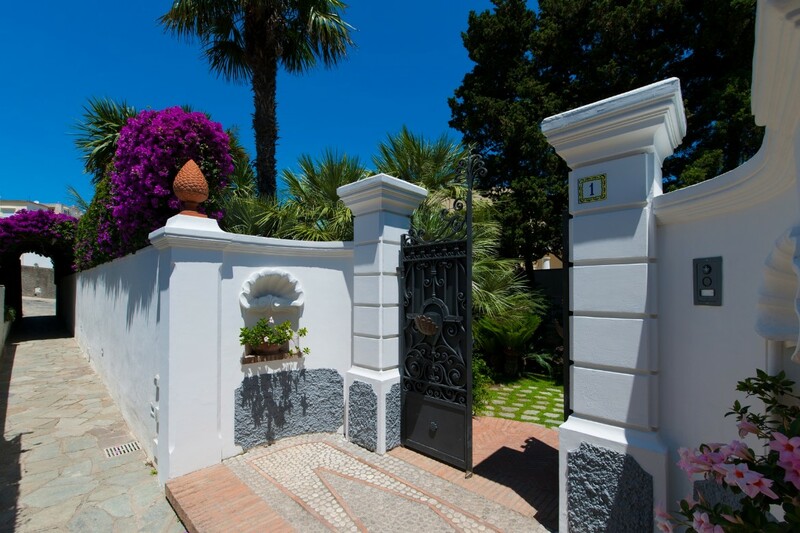 Access to the property is easy and stair free, by means of a small alleyway leading off of the main square, through a private gate leading through 8 steps down onto the grounds of the Villa. 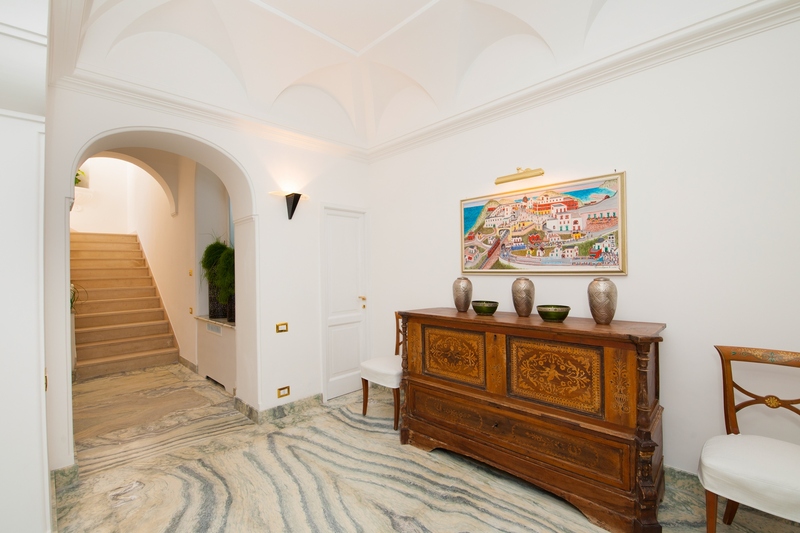 Entrance into the villa is through a small foyer, which leads to a large, double living room with great marble floors, large lamps, and antique chests. 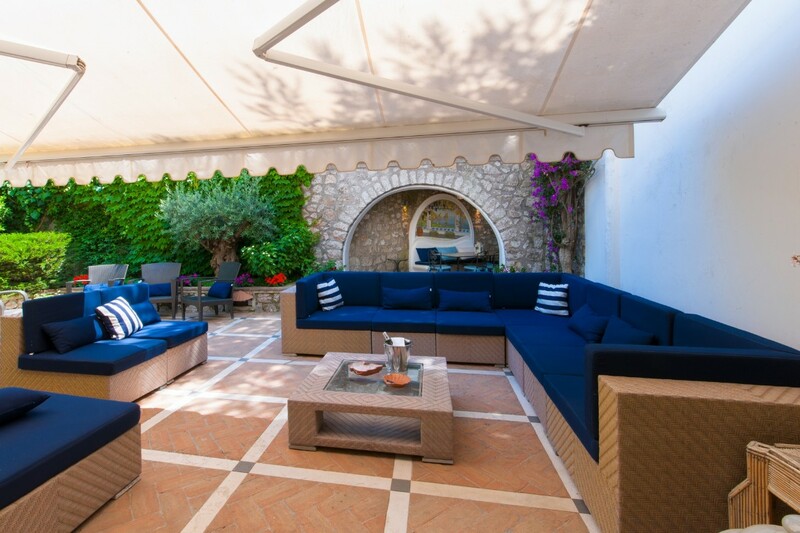 The living room enjoys several three and two cushion couches, a large, glass coffee table, and two beautiful décor urns with backlighting, satellite TV and air conditioning. 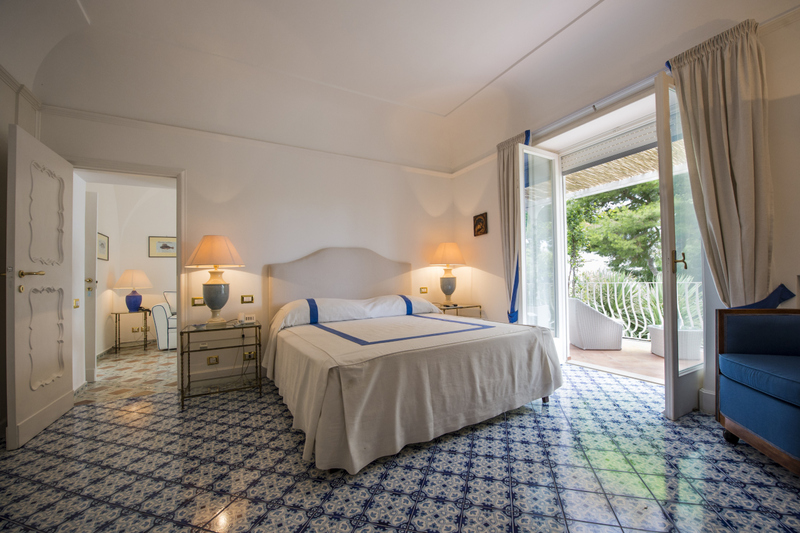 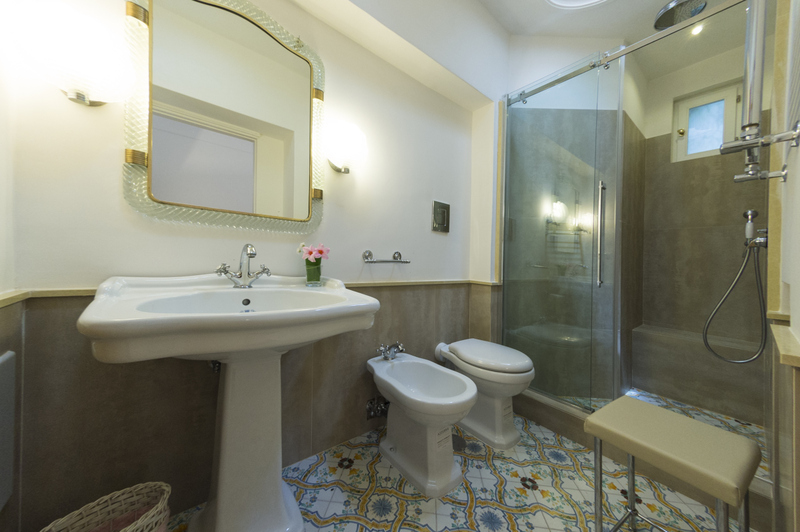 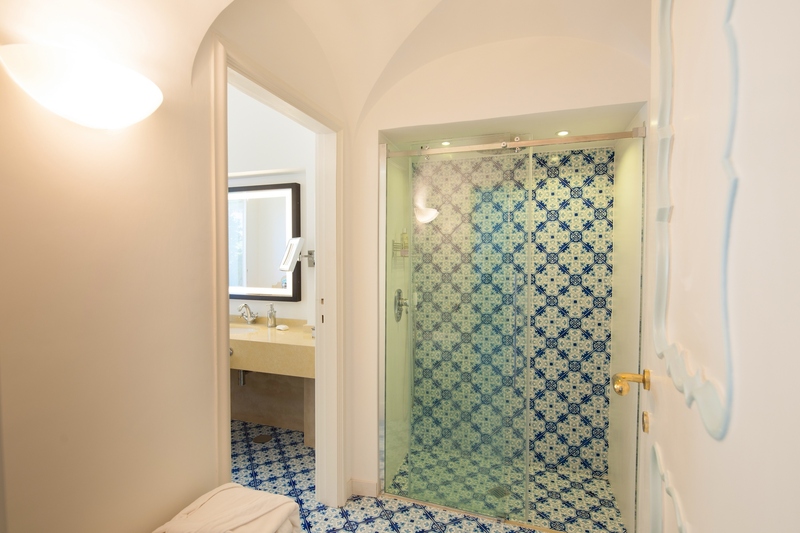 There is a ½ bathroom in dark blue, ceramic tiles and the entire first floor boasts large, white décor ceilings and a clean, fresh look. 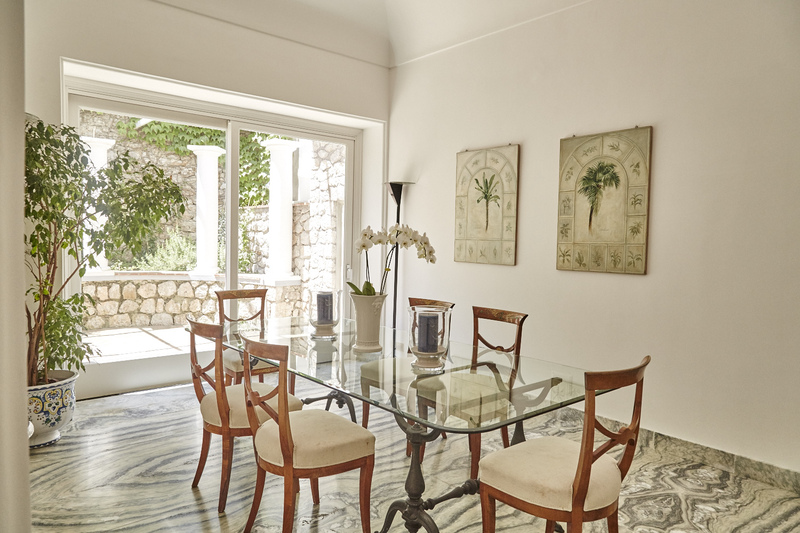 The living room flows into the dining room with a glass dining table for 8. 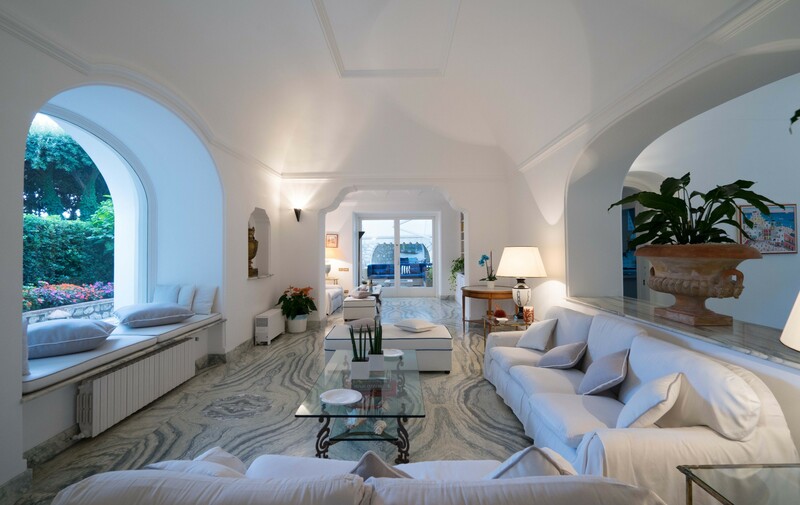 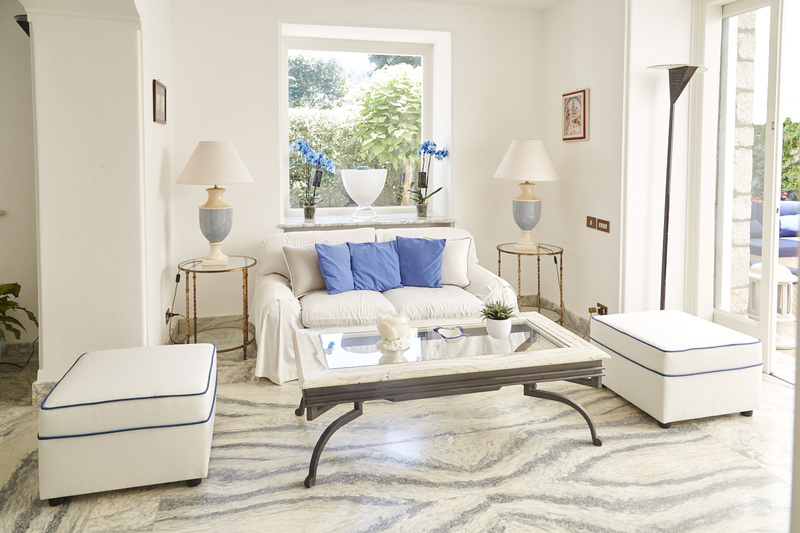 It faces to a white sitting area surrounded by columns in Roman style, which leads also to an external covered lounge area with several couches and large lounge chairs brought together by a large, glass coffee table. 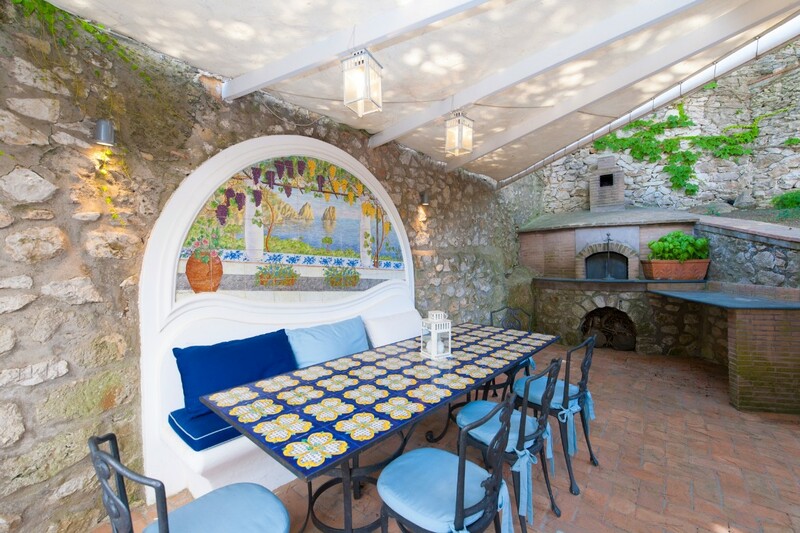 There is also a covered, external dining area with a long, ceramic dining table for 10, situated next to a wood pizza oven and a ceramic tile painting of Capri as a backdrop. 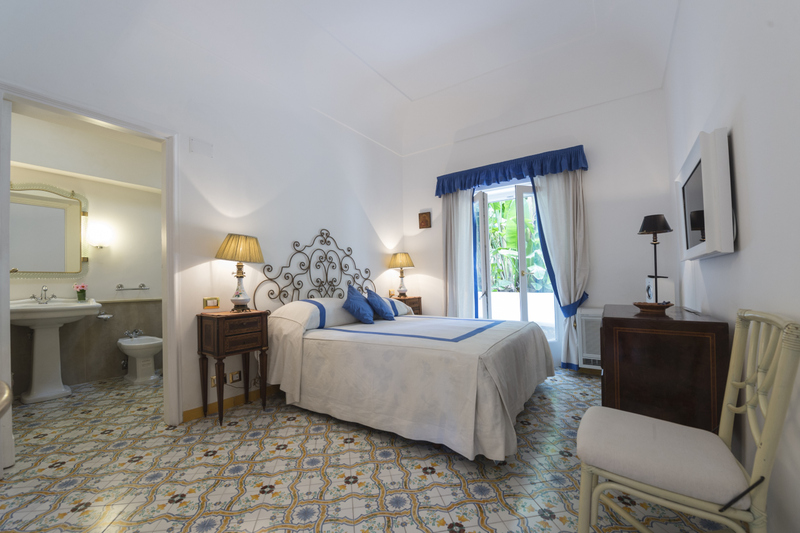 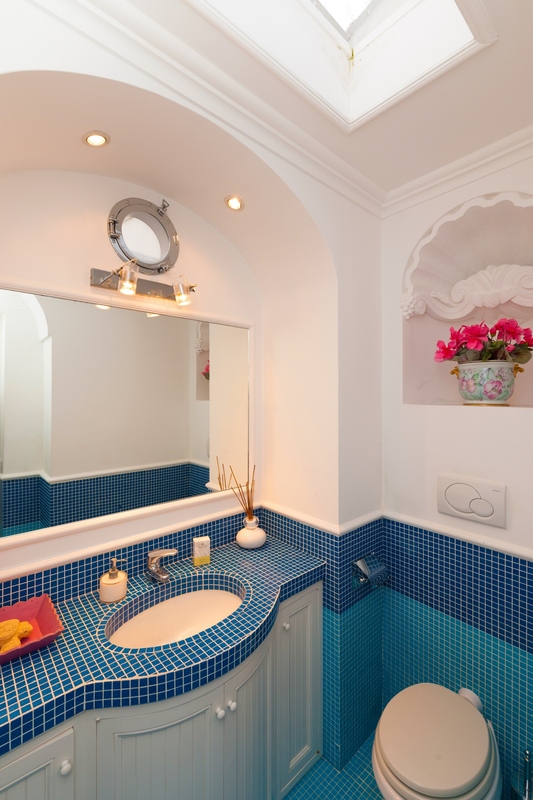 Inside the villa, on the ground floor, lies the first double bedroom with en-suite bath with shower (all bedrooms have air conditioning) and flat screen TV. 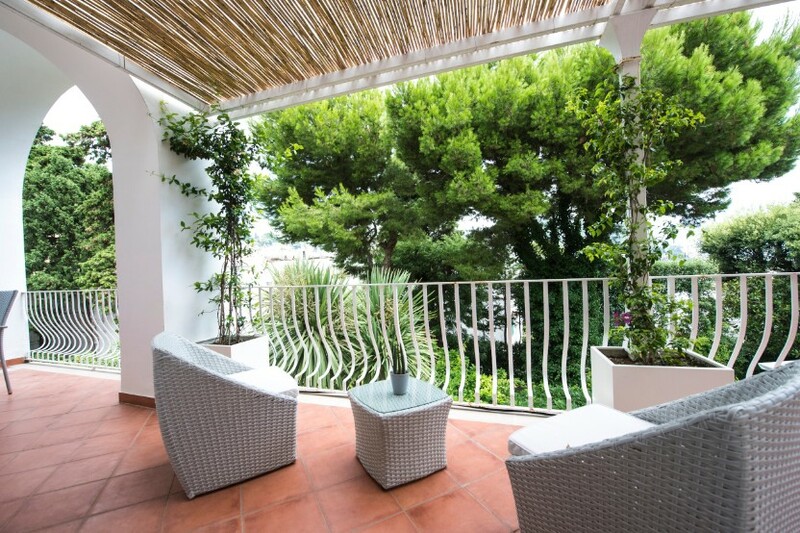 Private access to the terrace. 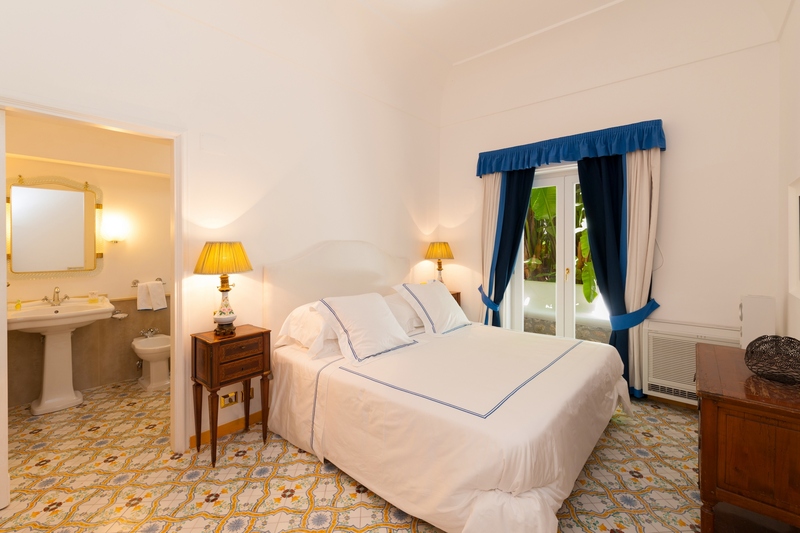 The second bedroom is a double bedroom with TV and en-suite bathroom with shower. 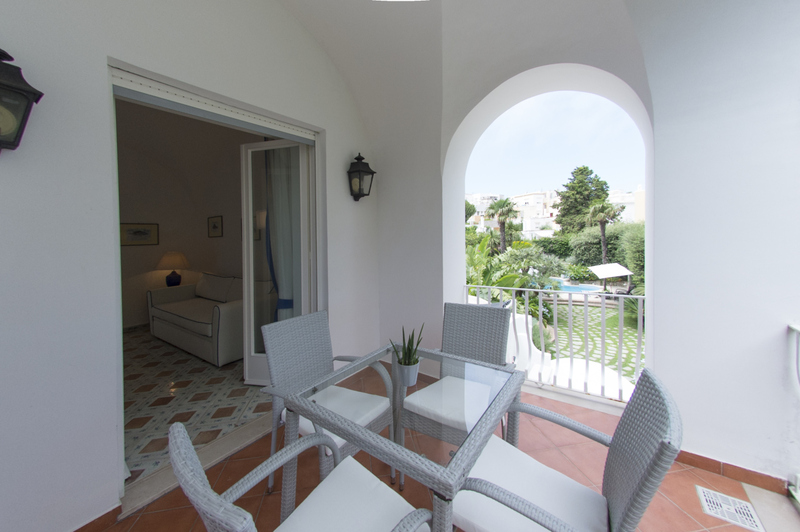 The room has entrance directly out onto an external terrace. 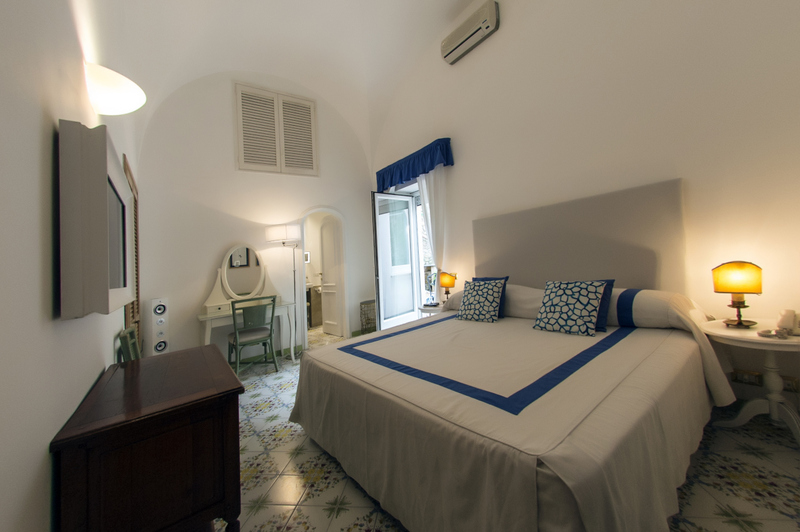 The bedroom enjoys a built-in closet, antique dresser, and ceramic tiled floors. 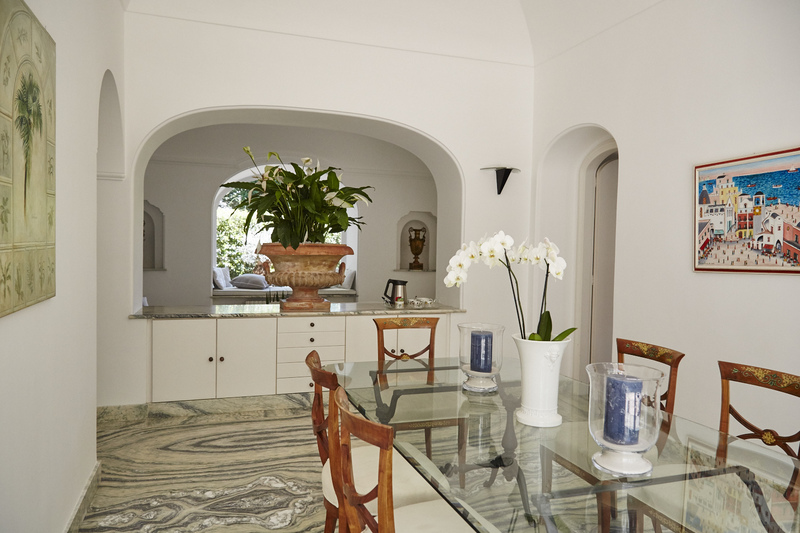 The ground floor also boasts a kitchen with refrigerator/freezer with icemaker, 6-range stovetop, oven, dishwasher, toaster, juice maker, scale, and bar table with 2 stools for dining. 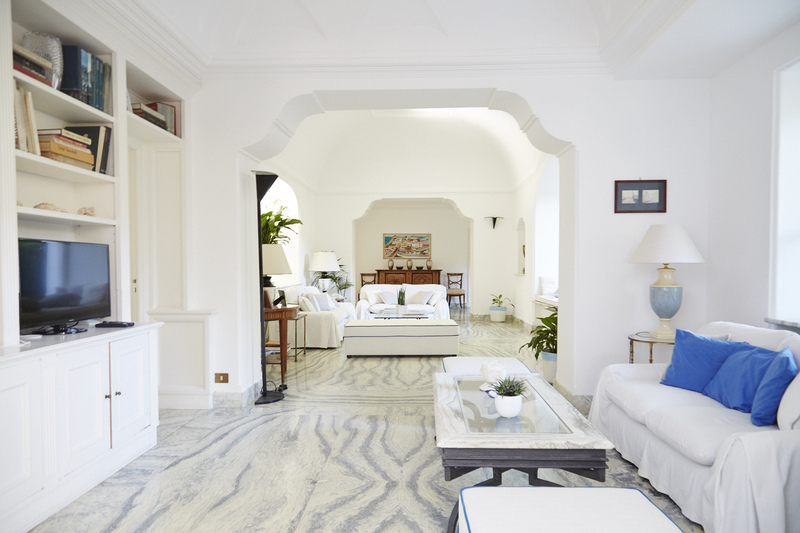 The first floor, up a flight of 20 stone steps, leads onto a ceramic tiled floor where the third bedroom, the master bedroom, accesses a balcony equipped with coffee table and chairs. 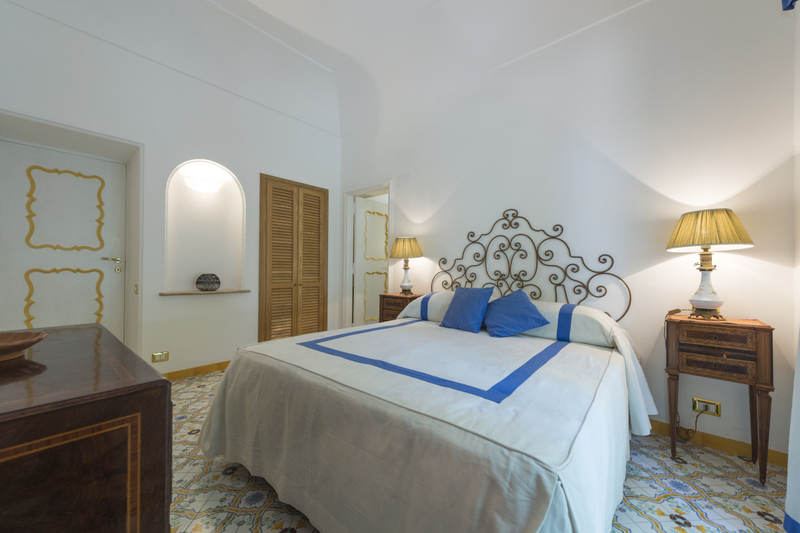 The master bedroom boasts a 40’ satellite TV, built-in closet, a foyer room with closet, and a large bathroom with Jacuzzi bathtub and shower. 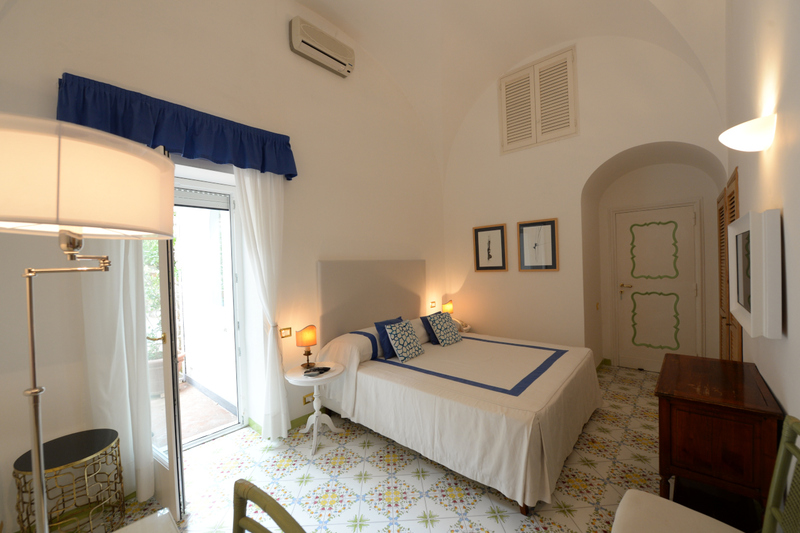 The master bedroom also enjoys an annex room with a single bed and blue, ceramic tile floors and TV. 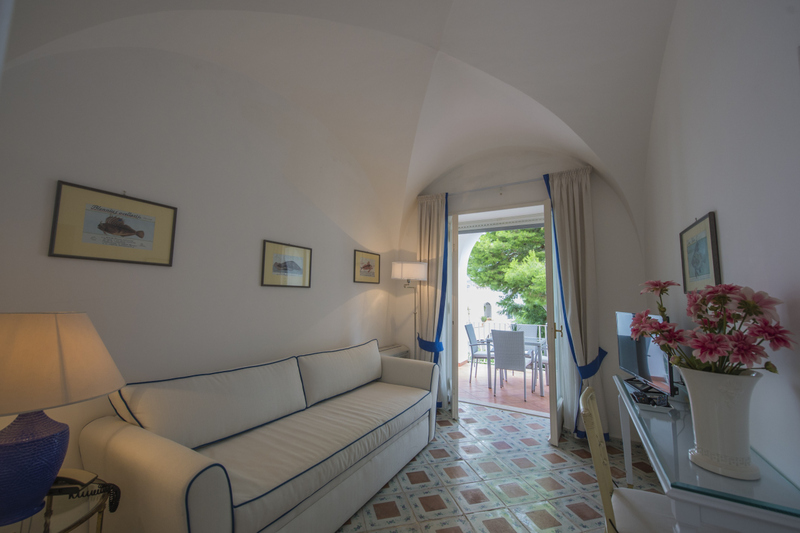 Double bedroom with sitting room with a single bed, TV, and air conditioner. 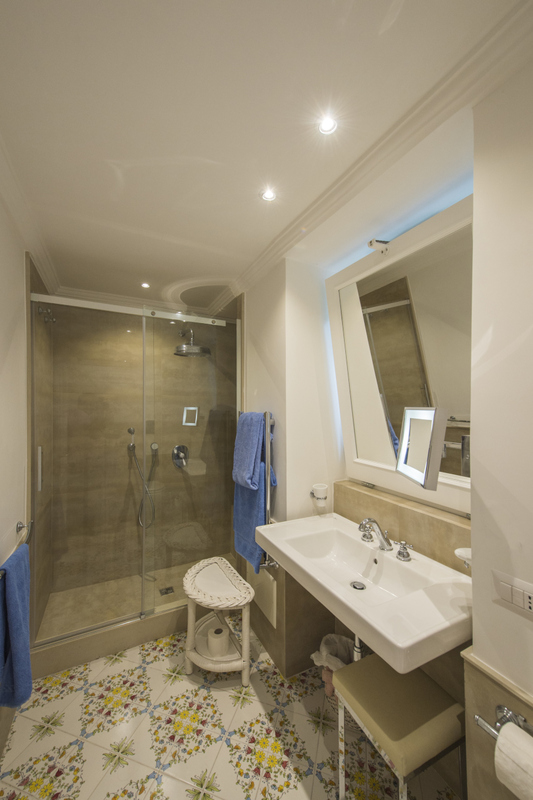 En-suite bathroom with shower. 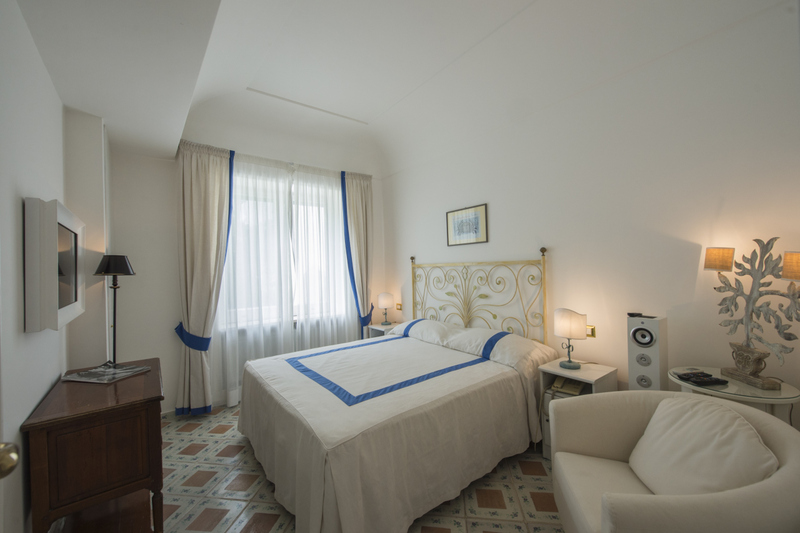 Double bedroom on the second floor with en-suite bathroom with shower. 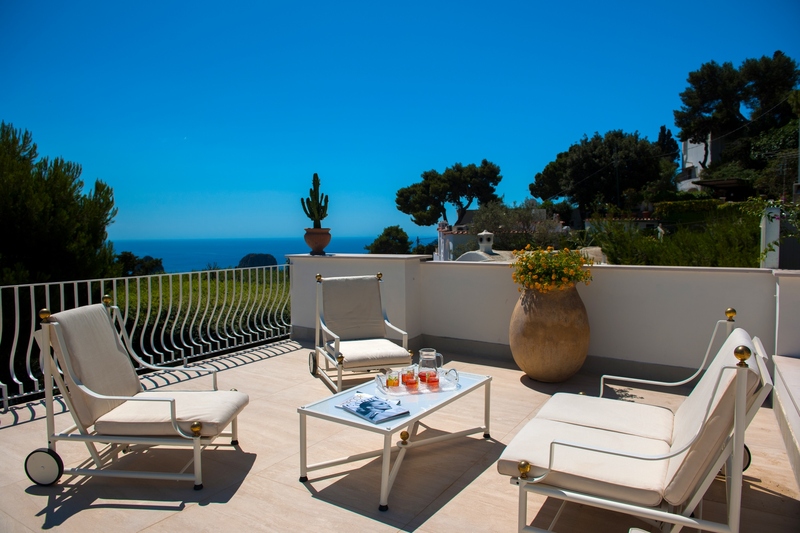 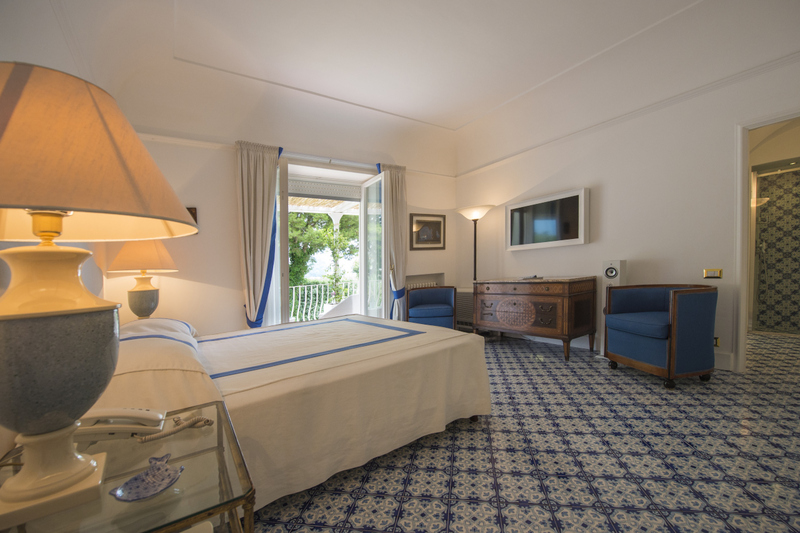 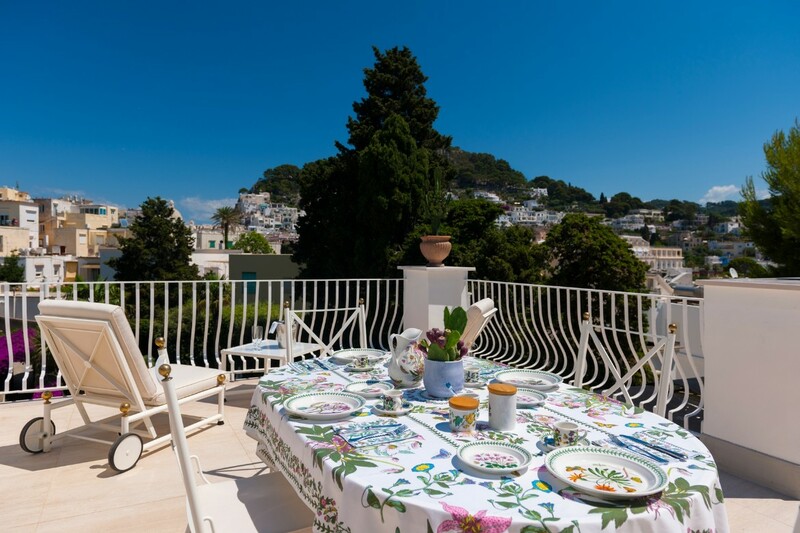 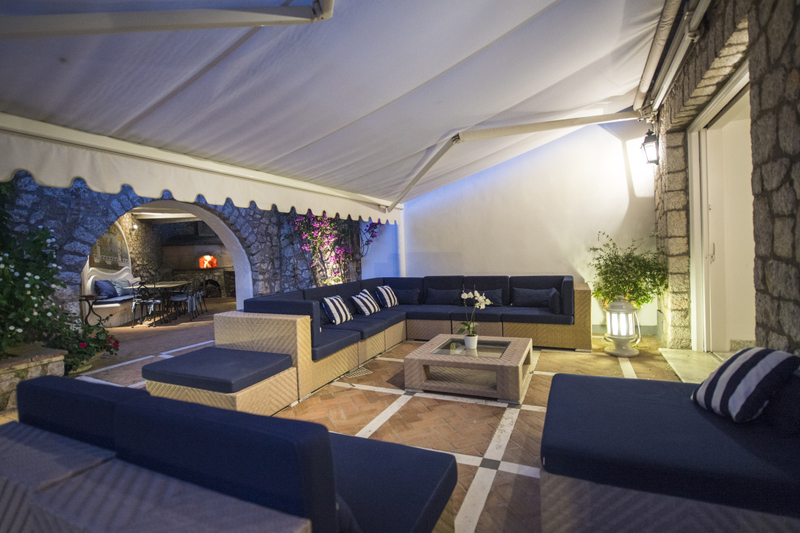 The rooftop terrace, located up a flight of 20 steps from the second floor, enjoys various seating areas with lounge chairs and sofa chairs, an oval dining table for 4, coffee tables, and great views onto the town of Capri and the infamous Faraglioni rocks. 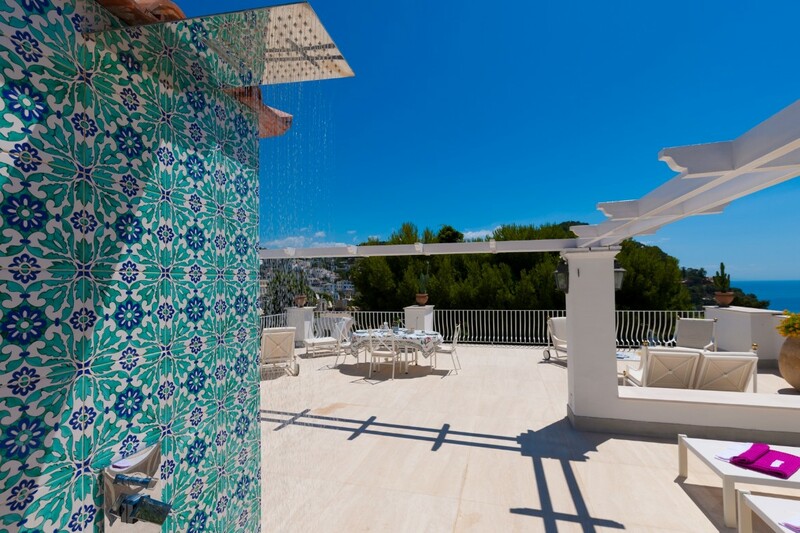 The terrace also enjoys two external showers, lovely décor pieces, and various types of floral. 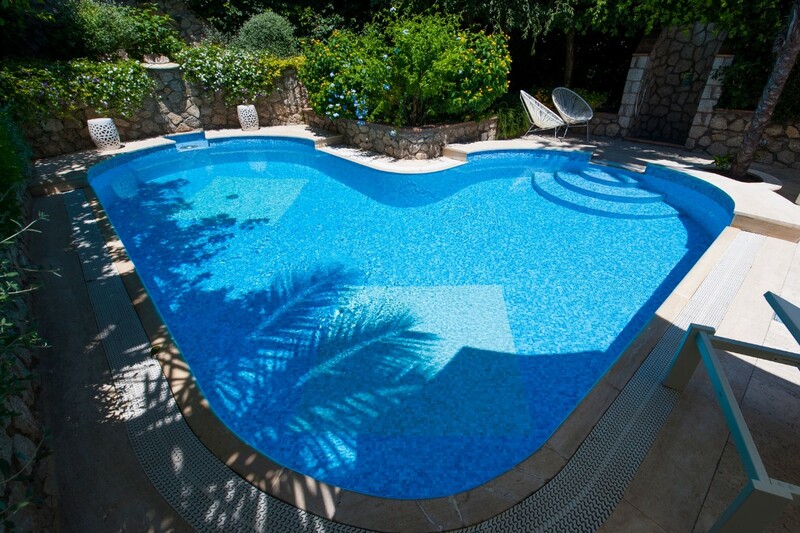 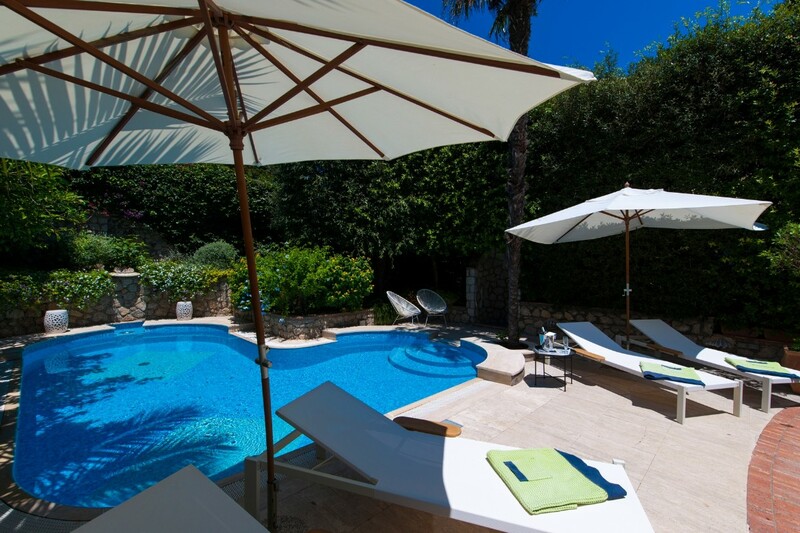 The pool deck, located in the front of the house, enjoys sun lounge chairs and a changing room.